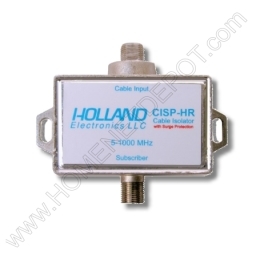 Holland Electronics' CISP-HR Coaxial Isolator provides galvanic isolation both the shield and center conductors of a standard 75 ohms coaxial system while maintaining low insertion loss for RF signals. The Isolator eliminates ground loops, and provides a degree of protection for electronic equipment from electrical transients and inadvertently “Hot” coax shield or center conductors. This helps prevent unwanted noise and picture interference in cable television systems. The Isolator’s frequency range is suitable for IPTV installations utilizing HPNA or MoCA signaling over coaxial cable. The metallic housing of the CISP-HR Coaxial Line Isolator provides adequate EMI shielding. It also is environmentally sealed to prevent ingress of moisture and humidity that has been shown to introduce CPD to a subscriber's premise drop. Isolates coaxial cable's shield, prereventing unwanted ground loop current on the shield of the cable, which can cause noise and degrade picture quality. DC Block on center conductor protects electronic equipment from hazardous voltages and electrical transients. Ground Isolation > 2000V. Isolation level between the service ground to customer ground is greater than 2000 V.
Get 100 more cable channels on your Roku with PlayOn. No risk, 30 Day Money Back Guarantee. Center Conductor DC Block > 1000V. Robust design includes a metallic housing that provides excellent RFI shielding of >85 dB. Housing is environmentally sealed against moisture and humidity. Dvice comes standard with “F” type Male-Female connectors.All ports comply to all existing SCTE standards. Product shows superior RF performance operating at a frequency range of 1 MHz-1 GHz. Maximum RF insertion loss is 0.5 dB. at 1 GHz. Listed to conform to UL 497C.